1.Adjust oven rack to lowest position. Preheat oven to 325°. Place roasting rack in 17 x 14-inch deep roasting pan. In small bowl, combine 2 tablespoons sage, salt, pepper and garlic powder. Cut 1 lemon into quarters. 2.Remove giblets, liver and neck from turkey cavities; freeze or save for later use. Prepare turkey as package directs; place turkey, breast side up, on rack in pan. Sprinkle inside cavity and outside of turkey with sage mixture. Place celery, onion and lemon quarters inside cavity. If not already secured, tie legs together with kitchen string; tuck wing tips under turkey to hold in place. Tent turkey loosely with aluminum foil; roast 1-1/2 hours. 3.Meanwhile, from remaining 2 lemons, grate 1 tablespoon peel and squeeze 3 tablespoons juice. In microwave-safe medium bowl, heat honey, lemon peel and 1 tablespoon juice in microwave oven on high 30 seconds or until easy to blend; stir in 2 tablespoons sage. With brush, baste turkey with some honey mixture. 6.Meanwhile, remove rack from roasting pan; with spoon, skim excess fat from drippings. Place roasting pan with drippings across 2 burners. With whisk, stir flour into drippings until well combined; add remaining 2 cans broth. Heat 4 to 5 minutes over medium heat, stirring frequently to scrape brown bits from bottom of pan. Reduce heat to medium-low; simmer 10 to 12 minutes longer or until gravy thickens, stirring occasionally. For smoother gravy, strain through fine-mesh strainer, if desired. Stir in remaining 1 tablespoon sage and 2 tablespoons lemon juice. Carve turkey and serve with gravy. 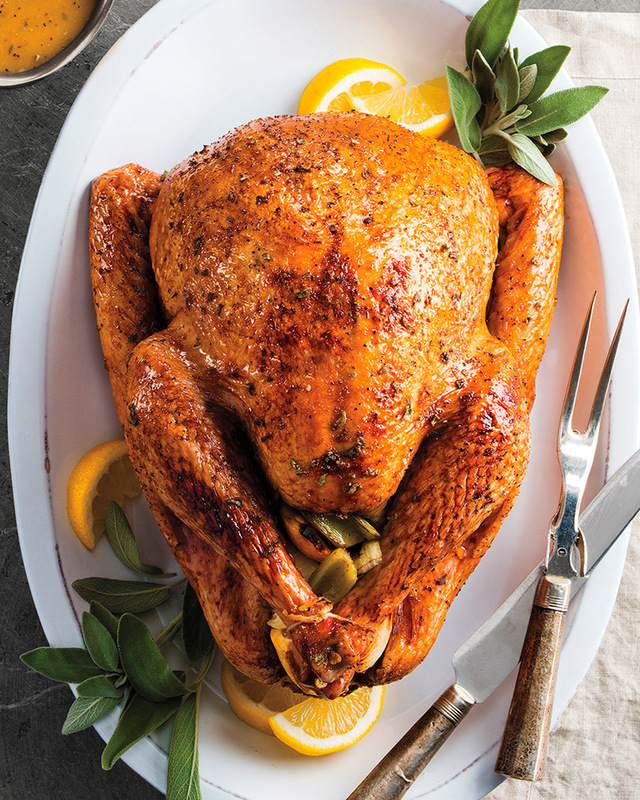 Plan ahead: When thawing a turkey in the refrigerator, it will take about 24 hours for every 4 to 5 pounds of turkey. Place the turkey in a container to prevent the juices from dripping on other foods. > Don’t know how large of a bird to purchase this Thanksgiving? Plan on one pound of turkey per person. This should provide plenty extra for those leftover turkey sandwiches or our turkey quesadilla.